by Dustin Huntington, President EXSYS, Inc.
Small businesses in the US have a wide range of regulatory requirements placed on them by many government agencies. Being aware of all the compliance responsibilities is difficult, and fully understanding the details and specifics is not only very time consuming but almost impossible. However, non-compliance can carry substantial fines. Lawyers and other experts that can assist a company in meeting requirements are an expensive option, and can sometimes even make a complex situation worse. The traditional government approach has been to provide information through various pamphlets, brochures and often slow "help lines". More recently, Web sites have been used to present and explain the regulations to the public. In theory, all the information needed is available. But actually finding it, reading it, understanding it and acting on it is still a daunting task. This is a classic example of the difference between �information�, and �knowledge�. What has been made available is "information", and the Web has made the dissemination of information and data easy. The government has many Web sites that provide a wide array of information resources. Search engines allow access to vast amounts of information on any subject, from many sources, to be found quickly. Is the source of the information authoritative? Is the information complete and consistent? Does the information actually address their questions? Does the information consider their special situation? If they can answer, "Yes" to those questions, they then have to read it and understand it well enough to feel comfortable acting on it. For the typical businessperson this may be confusing as regulations are likely to be written in legalistic terminology that the reader may not be familiar with. Even "simplifications" of the regulations tend to use technical terms, since as official government documents they must convey the same meaning as the regulations. Non-government "explanations" while easier to understand, but may not be authoritative, and may even be inaccurate. So today, millions of small-business owners are required to be aware that they have compliance responsibilities in many areas. They are also expected to be able to search the Web to find reliable sources of relevant information and learn enough about each regulation to make an informed action. That is quite a lot to ask, and it is no wonder there is so much confusion, error and delinquency. The errors can expose small businesses to potential fines for not following the regulations. Also, assuming the requirements have a valid reason for being on the books (and most do), non-compliance can lead to issues of health, environment, worker safety and even national security. On top of that, there is the huge cost incurred by government in attempting to "educate" the public on the regulations, and answer questions in a correct and consistent way. This is made even more difficult due to employee turnover, new regulations and changing interpretations that require continual training and retraining, production of new documents, and the effective promulgation of any changes. The U.S. Department of Labor's Small Business Administration is well aware of the problems that small businesses face in dealing the myriad of government regulations. Their solution was to have a Web site with interactive Exsys CORVID Knowledge Automation Expert Systems to distribute "Knowledge" rather than "Information". This is a very important distinction � and a great step forward in bringing usable knowledge to the public. Information and data can be viewed as a source of knowledge. However, it requires analysis, usually in a formal learning setting or through years of experience, to generate understanding and knowledge. Even though all the information is widely available, few people have the time and inclination to study it thoroughly enough to convert it to knowledge - even for one regulatory area, much less all of them. The SBA used the well-proven EXSYS technology and services to encapsulate the �know-how� needed to comply with various regulations. Instead of business owners searching the Web and reading page after page of data, they simply answer questions presented by the systems, through the user�s Web browser. They are only asked relevant questions that the user can easily answer. At the end of the session, the user is presented with situation-specific recommendations and answers. The entire process emulates the conversation the user would have with a human expert to get their questions answered - but this expert is available over the Web 24/7, and has all the latest regulatory information. For over 20 years, EXSYS expert systems have continually proven to be the best and most effective way to represent human decision-making processes. Other technologies such as neural nets, fuzzy logic, genetic algorithms, etc., have worked for some problems where "guessing" at an answer is adequate (or the best that can be done). However, for problem-solving tasks that are well understood and documented, nothing beats a rule-based expert system. The recent development of Web-enabled expert system tools now allows 24-hour access and interactivity to online knowledge automation expert systems. Regulatory compliance is ideal for deployment via Exsys CORVID expert systems. Most regulations are written in a form that easily converts to rules and are stated in terms of "If � Then�" statements. However, there is an important and fundamental difference between just providing the user with the If/Then statements as "information", and putting the same If/Then statements in an expert system. The difference is the Exsys CORVID "Inference Engine". This is the brain of the expert system that interprets, analyzes, sorts and makes sense of the various rules, rather than relying on the user to do this. The inference engine determines what rules are relevant to the problem being solved, what facts are needed to determine if those rules are true, and how to derive or ask those facts. If the needed facts are available from other rules, the inference engine will automatically use those rules, allowing even a complex problem to be broken into small maintainable pieces. The user is only asked relevant, focused questions that relate to their situation. Since the inference engine looks at all the rules, no relevant regulations are overlooked, but no unnecessary questions are asked of the user. At the end of the session, the user is presented with an answer or recommendation based on their specific input and the rules in the system. The user never needs to see, read or understand the rules - that is done by the inference engine and allows "knowledge" rather than "information" to be delivered. The user is given their answer in the fastest and easiest way - similar to a quick conversation with a top expert. Exsys CORVID tools help capture the logic of decision-making rules in an easy to follow intuitive way, and present systems to end users in attractive and interactive interfaces. Systems can be delivered over the Web, using CGI, Java applets or Java Servlets � or they can be downloaded as stand-alone applications. These deployment options bring a huge advantage to disseminating expert systems. Now a system can be fielded on a Web page and made available 24/7, around the world. Updates need only be made to the one location on the server, and all users will be running the latest version. If a regulation changes, a few rules are modified and the change is provided to everyone running the system - without requiring notification, reeducation or retraining. The SBA recognized the usefulness and practicality of using Exsys CORVID expert systems to deliver regulatory knowledge to businesses via the Web. However, they were not the first government agency to do so. OSHA has for many years very successfully used expert systems to help companies understand and comply with OSHA regulations. 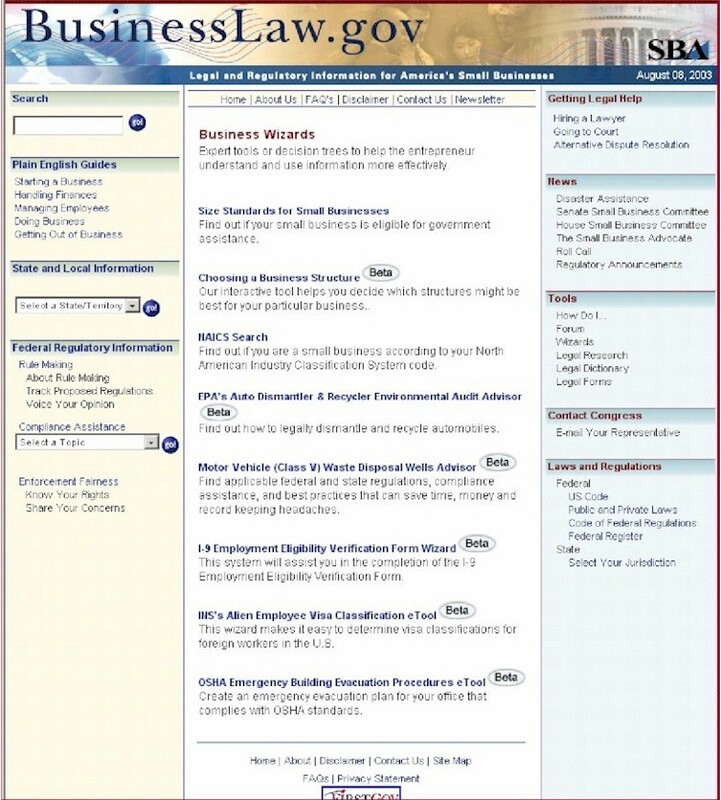 (See http://www.osha.gov/dts/osta/oshasoft/index.html and look under the "Expert Advisors" section). The Department of Defense has many EXSYS expert systems for a wide range of issues, as well as the EPA, USDA, DOE, USPS, and the Federal Highway Administration. Various state, local and Indian tribal organizations and even government agencies in Australia, Malaysia and many others have fielded regulatory expert systems. They are also widely in use for regulatory purposes in industry to assist companies in complying with government and internal policies. Seeing the large number of systems already in use, SBA did not view their approach as high risk or "cutting edge". The systems created by OSHA, SBA's sister agency in the Dept of Labor, received high praise from Congress and the Secretary of Labor, and they were awarded the prestigious NPR Hammer Award presented by former Vice President Al Gore�s Best IT Practices in the Federal Government � A Joint Project of the Chief Information Officers Council and the Industry Advisory Council. Using expert systems was the clear choice for delivery of knowledge. Building a regulatory compliance expert system is conceptually very simple. Just convert the individual steps in a regulation to the If/Then rule form of the expert system, and let the Exsys CORVID inference engine process the rules to ask focused questions and present recommendations. That is always the core of the logic in a regulatory system and many systems really are that easy to build. However, regulations are often not written in exactly the correct form, have procedural operations that are not based on logical operations, or have complex interface requirements. This requires some skill in building the system and integrating it into a Web site. 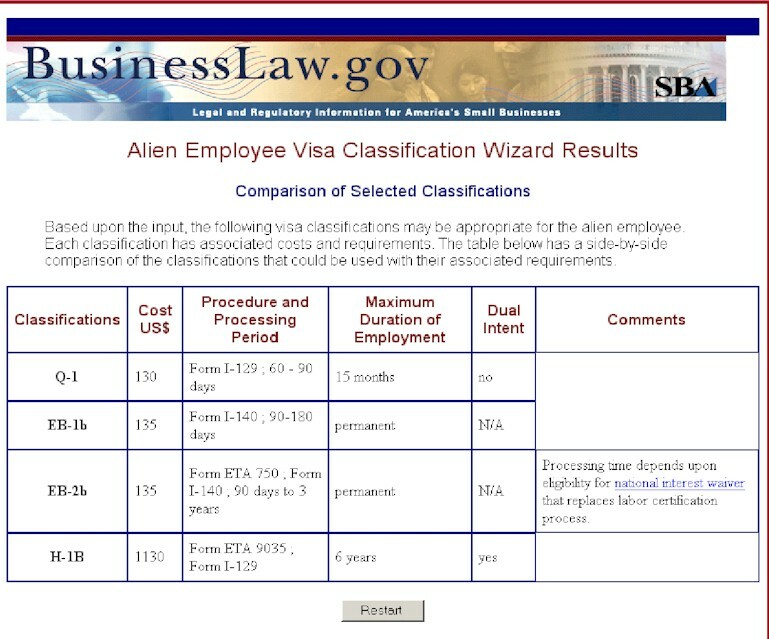 or just go to www.businesslaw.gov and click on the "Wizards" link on the right under "Tools". Choosing a Business Structure -- Which business structure (Corporation, LLC, etc) is most suitable for a new company? More systems are planned pending funding, assistance and sponsorship from other government agencies. Two of these, the I-9 Form and Visa Classification systems will be examined in detail below since they illustrate many of the issues in building regulatory systems. The Visa Classification system is a prime example of a set of regulations that are complex and difficult for humans to work with, but was quite easy to solve using an expert system. There are dozens of categories of visa that can be used when entering the US. Each has specific requirements, limitations and conditions for use. Selecting the correct type of visa is important since an error can have serious consequences and require returning to the country of origin to correct. Each applicant has to consider each type of visa independently, look at the many regulations that apply to them, select or exclude appropriate categories, and then analyze and classify all of them to select the best ones overall. Most of the rules are independent of each other, meaning there is no underlying tree structure or organization to help the applicant quickly find the correct category - just a large number of regulations and categories. This is the type of decision-making problem that is difficult to explain or "teach" to new people. It requires understanding and remembering a large number of factors, and correlating them across several dozen possible categories in order to find the best solution. However, having many independent rules that need to be combined logically is what an inference engine is designed to do. It automatically and rapidly does the complex logical sorting and organizing that the human mind has great difficulty doing. Building the system was simply a matter of inputting the specific rules for each category, describing under which conditions a category is a good recommendation, and when a category is excluded. Each of the rules was independent of the others, though they used the same terminology. The Exsys CORVID inference engine was then instructed to find all acceptable categories for a user. It automatically used the rules to determine what questions to ask the user, and combined the input to select or eliminate categories. The results were displayed in a table on a Web page. Since the rules in the system are just English �If/Then� statements, they are easy to maintain and update as regulations change. Also, and this is of key importance, they can be read by the approval staff at BCIS (Bureau of Customs and Immigration Service), which had to approve the system for fielding. Some expert systems, using other tools are written using complex and difficult to read syntax that may make sense to the programmer, but will not be readable by the approving authorities. If a system cannot be understood and validated, it will not be fielded. It is important to build a system that can be easily understood. The Visa Classification system was an ideal expert system project. It was built quickly and at a very low cost. It handled an important and complex problem that humans have great difficulty solving. Attempting to solve this problem with just information and data provided through Web pages would have been virtually impossible due to the complexity and scope of information required to make a decision. It is unlikely that users could have been effectively educated at the level required to make valid decisions, and the "educational" materials would certainly have cost far more to develop and maintain than the expert system. The Exsys CORVID expert system approach allowed the core knowledge to be directly delivered in a way that made it easy to use without requiring that the user learn or understand this complex regulatory area. 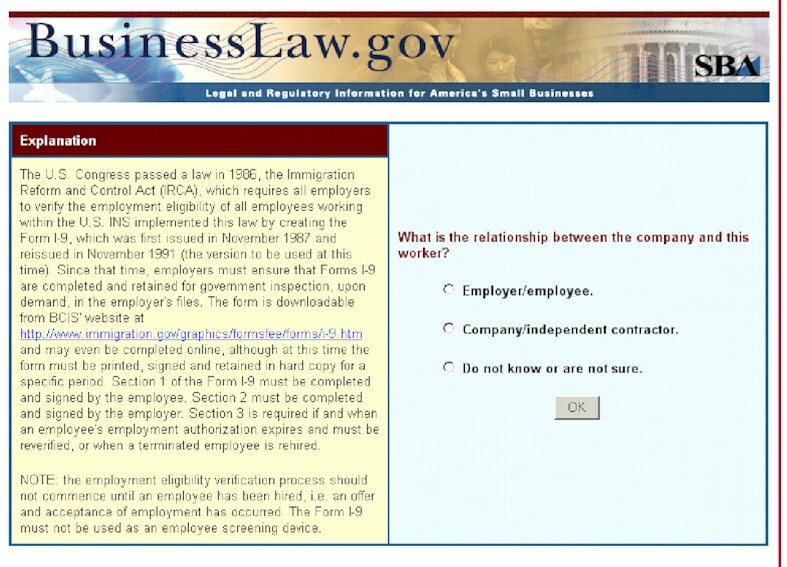 The I-9 system was created to help companies fill out an I-9 form for foreign workers. This is a form that verifies that each worker has the correct documents and credentials to work in the US, and that the company has this information on file. This seems like a simple problem and one that should be able to be handled without an expert system. The form is not long or complicated and has reasonably clear instructions. However, in practice, many errors are made in understanding and filling out the form. One of the goals of the system was to produce a completed I-9 form in PDF format that could be printed, signed and filed. Generating a form is not a logical decision, but rather a procedural operation. Purely procedural functions can be done using an expert system inference engine, but they are not the normal mode of operation, which is more oriented toward logical processes. However, within the procedural operations were logical ones. For example, the correct documentation must be supplied and verified. In some cases, combinations of items are required. If the documentation is not correct, the employee needs to produce an alternative. In addition, before the system even starts to fill out a form, a determination has to be made if the form is necessary. This is based on if the worker is an "employee" or "contractor". For many workers this is a straightforward determination, but that is not always the case and the Exsys CORVID system can lead the employer through the steps to make the determination. In addition, the I-9 system makes a special point of providing a detailed explanation of its steps. Most questions have an explanation box that educates the user about that part of the regulation. This can be used to help the user understand the questions, or better understand why this fact is important in the system. Since the explanation is associated with the question, it is only displayed if the logic of the systems requires the question to be asked. Using an Exsys CORVID expert system for the procedural steps allowed the logical portions and explanations to be easily added. Using other approaches, such as HTML forms and Java script, while perhaps suitable for the procedural part, would not have allowed the logical portions to be added easily and seamlessly. In the end, the Exsys CORVID expert system approach was the best option to handle the overall problem. As with the Visa Classification system, the fact that the system rules can be easily read simplified the review and approval process. Even though the process of filling out the I-9 is not difficult and could be solved with "information", delivering it via an Exsys CORVID expert system makes it far easier and more foolproof. The employer does not have to follow written instructions - which have proven to be prone to errors, misunderstanding or just ignored. Employers simply open a Web page, answers a few questions, and the completed form is printed out � all that�s needed is a signature. Building this system was more complicated than the Visa system, but this was largely due to the procedural operations clarification by the expert, and the need to build a completed I-9 form in PDF format. The system was still built quickly and at low cost. It would have cost as much, or more, to build a Web-based solution using non-expert system techniques, which might have provided the procedural completion of the I-9 form, but without logical validation or analysis of the need for the form in the first place. It is much better to deliver knowledge rather than information. Exsys CORVID expert system technology works well for many types of regulatory compliance systems. It takes less time and expense to build an Exsys CORVID expert system that delivers knowledge, than to build an effective Web-based "Information only" system, which will actually deliver adequate information. Regulations are generally written in a form that is close to the If/Then syntax of expert system rules, making system development fast and low cost. Using EXSYS expert system consulting services allowed the SBA to concentrate on management of the project, rather than becoming systems builders and allowed multiple systems to be built in parallel. While logic can be programmed in many ways, as the complexity of a problem increases eventually the rules must be separated from an "inference engine". Using non-expert system techniques (forms, Java script. etc.) to program logic is not scalable. Exsys CORVID expert systems have a high R.O.I. - both in terms of improving user efficiency and reducing errors. Regulatory compliance expert systems provide the public with the answers they need to comply with the law and help to implement the policies that underlie the regulations. Using Exsys CORVID expert systems, both internally and externally, allow new or changed regulations to be rapidly disseminated without re-training. Using Exsys CORVID expert systems allow the public to get the answers they need in the fastest most effective way. Once a system is fielded, it is available 24/7, has minimal maintenance costs and is highly scalable. If you build them, they will come. The public wants answers - not data. Once they find a Web site that can quickly and reliably answer their questions, they will use it. He is the founder and President of Exsys Inc. In the late 1970s, Mr. Huntington had extensive experience in the Washington DC area for the US Atomic Energy Commission (AEC) and follow-on agencies, The US Energy Research and Development Authority (ERDA) and US Department of Energy (DOE). In the early 1980s, while in Albuquerque, Dustin became interested in expert systems and he decided to design and build his own expert system development software. Rather than copying earlier work, Dustin decided to take a fresh and pragmatic approach to the tool. Dustin Huntington received his BS and MS in Physics with a minor in numerical analysis from Steven's Institute of Technology. From his background in numerical analysis, he felt that while the underlying mathematical algorithms of other expert systems were valid, they were unnecessarily complex for the representation of the "rule-of-thumb" data that most expert systems are built upon. Dustin designed a PC-based tool that would be easy for non-AI specialists to learn, but which would provide adequate power to accurately handle complex real-world problems. This work evolved into the first version of Exsys software, which was released commercially in 1983 and Exsys Inc. was founded. That system was one of the first expert systems developed with a "small" development tool to win a prestigious AAAI award for "Innovative Use of AI". Mr. Huntington is a frequent speaker at government and industry conferences on implementing expert systems for predictive maintenance, quality enhancement and help desks. He has written many articles explaining how to use expert systems effectively and profitably. He has worked as a consultant on expert system projects with many companies including Dupont, Kodak, the US Air Force, USDA and First Data. Dustin Huntington continues to design new expert system development and delivery tools that take advantage of new technologies and integration. Exsys� Inc. (www.exsys.com) is a leading developer of knowledge automation expert system software. Founded in 1983, the company's expert systems allow web sites to directly deliver interactive problem solving knowledge. These systems emulate a one-on-one conversation with a human expert to provide precise answers for each individual question. 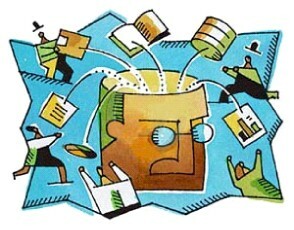 Exsys' expert systems provide the "brains" for virtual representatives on the Web; automate customer support; provide smart answers to customers making purchasing decisions; ensure regulations are followed consistently; perform background filtering; analyze data streams and provide unique online interactions. Call (505) 888-9494 for more information. What is the general purpose of the SBA expert systems? Are these systems examples of decision automation or knowledge-driven DSS? Are the web-based applications at BusinessLaw.gov part of a Decision Support System? Why or why not? What is an expert system? What are "IF/THEN rules"? Would tradional programming languages provide the same capabilities? Why or why not? What is the major benefit of using EXSYS? Why? Should other government agencies create this type of decision support capability? Why or why not? Huntington, D., "From Information to Answers: Transferring Expertise at the SBA", November 3, 2006, at URL DSSResources.COM. Nancy Clark (nclark@exsys.com), Director of Communications, Exsys Inc. provided permission to publish this case study at DSSResources.COM on October 16, 2006. This case study was posted at DSSResources.COM on Friday, November 3, 2006.